Ash finds his idyllic new life in Jacksonville interrupted by Deadites. Had you told me two decades ago that horror fans one day be gifted a weekly Evil Dead TV show, I would have cackled like a Deadite. 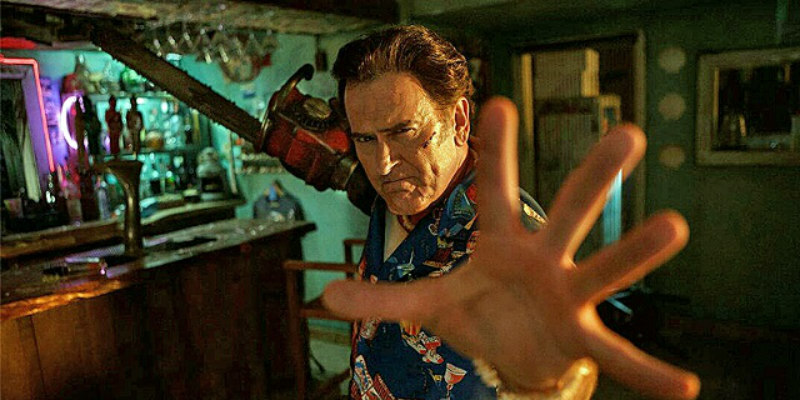 Yet here we find ourselves in 2016 with the premiere episode of a second season of Ash vs Evil Dead, a show that, thus far at least, has served as an exercise in how to effectively mine nostalgia while moving a franchise forward. My one major complaint with the show's first season was how it often felt like the various episode writers were ignoring their colleagues' prior work, with characters introduced and set up in a manner that makes you feel as if they're set to be major players, only to have them killed off an episode or two later - I'm looking at you Heather and Amanda - leaving subplots hanging like the entrails of a victim of Ash's chainsaw. Whether this continues in the sophomore season remains to be seen. 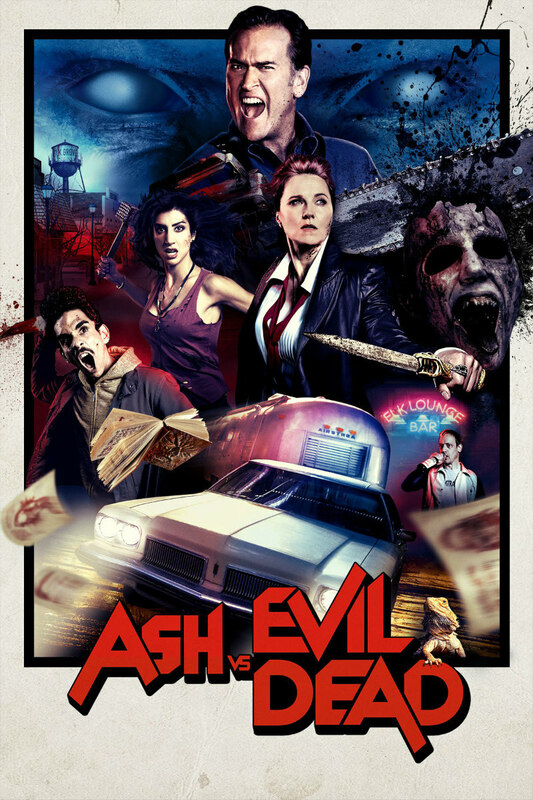 This first episode reintroduces the show's main quartet of characters: Ash (Bruce Campbell), his companions Pablo (Ray Santiago) and Kelly (Dana DeLorenzo), and villainess/anti-hero Ruby (Lucy Lawless). When we last saw this bunch, Ash and Ruby had agreed a truce, with the former handing over the Necronomicon to the latter in exchange for the lives of his buddies and a tank full of gas to get them to Jacksonville, Florida, Ash's unique idea of paradise. Season Two kicks off with Ruby battling Deadites herself; it seems her control of the book hasn't quite worked out. Meanwhile, Ash is living out his mid-life crisis, partying with college kids while Kelly and Pablo work their asses off at a bar. The keg-swilling antics are brought to a halt, along with Ash's plans of sticking his "man-meat" into a "Mommy-Daughter sandwich", when the two women in question suddenly transform into Deadites, resulting in the bloodiest Spring Break since the Cancun Tampax drought of '88. Ash finds himself summoned by Ruby to return to his home town of Elk Grove, Michigan, where he reconnects with his estranged father, Brock (Lee Majors; a truly inspired piece of casting), and an old high school sweetheart, Linda (Michelle Hurd), now married to the local Sheriff, Thomas (Stephen Lovatt). Meanwhile, Pablo finds himself suffering from horrific visions, seemingly a result of having the Necronomicon wrapped around his face in the climactic battle of the Season One finale. Speaking of climactic battles, that's how this episode ends, as Ruby arrives in Elk Grove, followed by skeletal type Deadites. Ash revs up the chainsaw, pumps the boomstick and dispatches the baddies in customary fashion. Director Rick Jacobson, who helmed the Season One finale, does an efficient job with said action, but writer Craig DiGregorio, who penned the previous episode, fails to deliver on the sort of 'Ash-isms' we've come to know and love; the episode is all too devoid of memorable quips from our chainsaw-handed hero. With Ash returning to his hometown, where he's far from welcome, and the introduction of some interesting new characters in the form of Brock, Linda and Thomas, there's certainly potential to explore some character drama amid the carnage. Will this season show an interest in doing so?